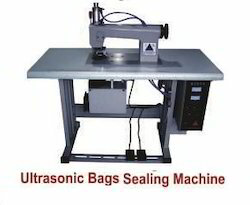 We provide our clients with premium quality Ultrasonic Bag Sealing Machine. These machines are manufactured using raw materials of the best quality. The bag sealing machines provided by us are durable, damage-resistant and sturdy. Clients can get these machines from us at highly economical market prices. The bag sealing machines offered by us are highly resistant to damage and are available to clients at reasonable prices. Established in the year 2000 at Delhi, We Matrix UPS Equipment Pvt. Ltd., are a Leading Supplier and reputed Manufacturer, Wholesaler, Trader and Supplier of a vast array of Power conditioning products like On-Line UPS, Servo Voltage Stabilizer, CVCF, Isolation & Ultra Isolation Transformer and Constant Voltage Transformer (CVT), Fully Automatic High Speed Non Woven Bag Making Machine, Ultrasonic Bag Sealing Machine, Automatic/Manual Handle Attach Machine, Printing Offset Machines, Rice Plantation Machine, LT Panel, Distribution Panel, APFC Panel and tern key projects for Rice and Dal Mills. These Products are manufactured by using raw materials of the best quality in accordance to industrial guidelines of quality. Our products are manufactured at our state-of-the-art infrastructure facility by using premium quality raw materials and components in accordance to industry-specified guidelines of quality. The products offered by us are easily accessible to clients at leading market prices in different specifications. Our products are available to clients in different specifications within the stipulated period of time. The products provided by us are known for their unmatched quality and are available to clients at budget-friendly prices.